I'm quoted a bit on MaX Lanes in this good summary article on "Seven points of conversation from Mayor Turner's Houston mobility plan"
Chicago Tribune: Chicago losing population, could be overtaken by Houston as 3rd-largest. Patrick at the GHP disagrees (bottom page 5). Speaking of Chicago, now you can take formal tours of the corruption, lol! "What would happen if your city, in the name of progress, started giving poorer residents vouchers for landline telephones rather than smartphones? Or if, rather than stocking public libraries with computers, so that people could write emails, your city installed fax machines? You would consider these unnecessary expenditures on outdated technologies. Yet when it comes to public transit, many cities splurge on modes designed for a different time and place—namely light rail. Instead these officials, often backed by federal grants, are throwing money into a century-old transportation concept that is unfit for most U.S. cities. This is a lazy approach, and insofar as it perpetuates the congestion crisis, it undermines the urbanist cause, by making dense living less convenient. It’s time for transportation planners to emphasize the future over the past." "And Houston, which lacks a formal zoning code, has become a city that, contrary to its reputation, features numerous skyscraper clusters and whole neighborhoods dominated by new townhomes. These trends point out a glaring contradiction in modern urbanist thinking. The people who claim they like density—such as planners, architects, environmentalists, and self-described progressives—also tend to prefer government centralization for cities. And they tend to oppose, as a broader principle, ideas that are market-oriented, anti-regulatory, capitalist, and pro-growth. But they seem not to have pondered how any of these variegated ideas actually work in practice within cities. Centralization has led to a stifling regulatory climate—most notably zoning—that prevents cities from adding new buildings and people, a point demonstrated by the New York Times. A hands-off approach, meanwhile, is what has proven to liberalize cities for this human influx, making them dense and dynamic." Which Sun Belt Cities Are Building the Most New Single-Family Homes. Houston is near the top along with Austin, Orlando, Charlotte, and Dallas. Pretty cool animated map of how Houston has dramatically grown since the 1940s. Finally: Arizona has solved pension reform, can we do something similar? Before getting to this week's smaller items, I'd like to feature a great piece by Market Urbanist Scott Beyer in The Federalist: How No Zoning Laws Works For Houston. It makes a great case for how Houston has been able to stay affordable while booming through enabling easy growth of housing supply (i.e. not strangling it with regulation). I'm extensively quoted in it, and although usually I would pull out excerpts here, this one has way too many great points - you'll just have to read the whole thing (honestly, it's not that long). Enjoy. Speaking of that, Forbes just ranked Houston #3 for cities doing the most to address the U.S. housing shortage, behind Austin (surprisingly) and Raleigh. A great NY Times feature on what makes Texas Texas, including twelve events/moments/places that make Texas Texas. "Better question: what if other cities fell out of love with it?" Kinder and the Chronicle react to the NextCity piece, to which I ask why would we want to empower NIMBYs to stop development? 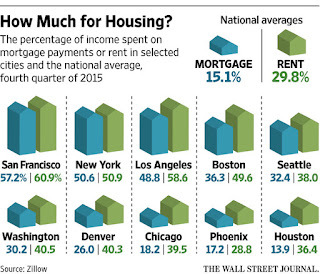 That's what happens in every city, and it cuts off housing supply rapidly leading to unaffordability. Is that what we want too? The Wall Street Journal just recognized us for growth without unaffordability - why do we want to eliminate one of our great strengths? If you're afraid of development in your neighborhood, make sure you move to one with deed restrictions, otherwise buy your house with your eyes open to how the neighborhood may change over time. GHP May issue of Economy at a Glance looks at apartments, industrial space, sales taxes, employment and foreign trade. Hat tip to Jay for this crime ranking of cities, which unfortunately we don't do so well on: "It's 'sortable' by investment in police, crime rank and community risk factors. What struck me is that Houston has among the highest investment in police, is only middle-high on risk factors, but is still second highest on crime. Clearly money spent is not money spent well." Finally, I was able to attend the Mayor's State of Mobility address today. It was a long, detailed, balanced, well thought-out speech on a strategy for addressing Houston's mobility needs. I agreed with almost all of it, with one notable exception being the claim that the Katy Freeway expansion was a mistake because it's just as congested as it used to be. That may be, but it moves twice as many people as it used to, and if we hadn't done it, congestion would be far worse out there, and I'm sure many employers in that corridor would have abandoned Houston for Katy, The Woodlands, and Sugar Land. One interesting item of note from the Mayor: he will *not* force rail on neighborhoods that don't want it, which means the University Line is essentially dead west of Shepherd as long as he's in office (not that I think METRO has the funds available in any case). 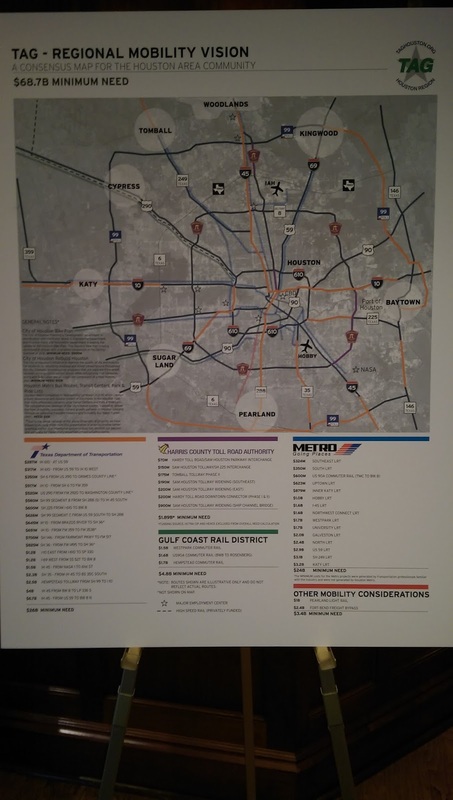 At the same event, TAG had this graphic with the consensus $69B Regional Mobility Vision. Two things really jumped out at me. The first is that METRO is showing $24 *billion* of new rail lines as a "minimum need"!! Not sure where that funding is supposed to come from, or if it did magically appear, whether all these lines would be the best use of it. The other thing that jumped out at me? Well, if you look closely, evidently the downtown CBD is moving to the East End... lol. 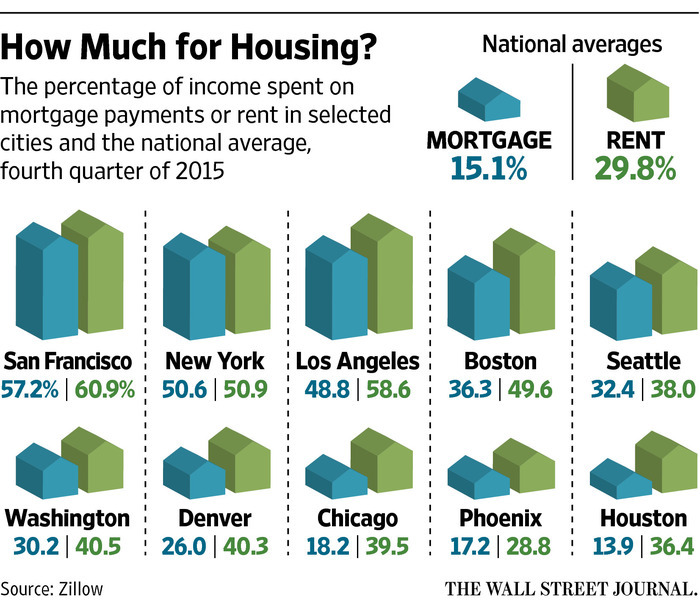 The WSJ on how to make city housing more affordable, which basically comes down to allowing more supply and variety rather than affordable housing programs, which are inherently very limited. Houston might be the best at the country at this, including the lack of zoning easily enabling townhomes, duplexes, apartment mid- and high-rises. Also has the novel - although exceedingly difficult - suggestion of improving schools so homes in those districts become more competitive. Love this chart - Houston wins, as you'd expect (and I expect that rent number to come down as thousands of new apartments finish construction during our slowdown). "IN A TRUE fairy tale of a transportation project, Texas spent a measly $4.25 million widening a highway and, in defiance of conventional wisdom among transportation planners, doubled the speed of rush hour traffic on a notoriously congested highway in Dallas." The Dallas Fed on the power of Municipal Utility Districts (MUDs) to increase housing supply. McKinsey: Urban mobility at a tipping point - As more of the world’s cities become congested and polluted, new business models and technologies are emerging to solve the mobility challenge. Too many strategies and graphs to summarize - you'll just have to check out the whole thing. Divisive national politics seem a distant concern. I think we're a pretty pragmatic and balanced "purple" city and metro. You can pick out the local patriots. Too many to name. “Public-private partnerships” are real. Houston First comes to mind - other suggestions? People know the civic story. I think Klineberg's annual Houston Area Survey helps a lot here. I would also argue for Houspitality here - whether people use the term or not, it definitely exists. They have a downtown. Has come a long way. They are near a research university. UH, Rice, TMC, and TAMU not far away. They have, and care about, a community college. HCC, plus Lone Star is growing rapidly with many innovative programs. They have unusual schools. KIPP, YES Prep, Harmony, Talent Unbound, and many others. They make themselves open. Huge strength of ours, especially with both domestic and foreign immigrants. They have big plans. See the bayou greenways, bikeways, and arboretum projects, among many others. They have craft breweries. St. Arnold's, 8th Wonder Brewery, and many others.